Zola Budd, former world record holder over the 5 000 m distance, lives in Myrtle Beach, South Carolina with her family and is mom to Lisa (16), Mike (14) and Azelle (14). Zola started running at the age of 14 and today, at 46, is still running strong. Running the Race (RtR): What are your current running goals? 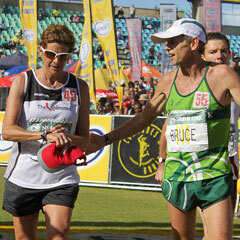 Zola Budd (ZB): I would love to run as a Master and then as a Grand Master, so currently I'm hanging on for 60+. I would also like to run a marathon in under three hours and perhaps do another Comrades Ultra Marathon next year. RtR: How do you ensure that running regularly forms a part of your weekly routine? ZB: I have a specific time dedicated to exercising each day. My friends and family are all aware of this arrangement and they respect it. As a mom you need to insist on dedicating a small portion of each day or week to exercise, or otherwise it will just not happen. It is also important to involve your children in your running by letting them run or cycle with you. I often treat the kids to smoothies or an ice cream after a family run, or by doing something that they enjoy. RtR: Any tips for women out there who want to start running? ZB: Get your family to support you. That is the most important thing. It is so much easier if your family gets up early to exercise with you, or if you are all tired in the afternoon and take a nap together. It is also important for your children to see that you exercise and watch what you eat. In addition, running with your kids gives them the opportunity to talk to you about everything that's going on in their lives. And they enjoy it too! Kids that don't like running can always join you on their bicycles. RtR: Any funny running stories/incidents that you would like to share? Thanks so much, Zola, for sharing with us some of your tips for running as a mom, wife and business woman. And all the best for that sub-3 marathon! Newton Running, which Zola markets, is launching a development programme in South Africa in October 2012. The aim of this programme is to identify runners in need and invite them to register. 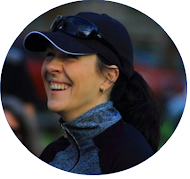 If accepted, runners will be invited to attend a Natural Running Form Clinic. After completion of the clinic (duration: 2 hours) the participant will receive a free pair of Newton running shoes, as well as educational materials. The cost of registration will be R50.00, which is payable in advance or at the venue. A regular Natural Running Clinic will also be presented by Newton Running in Bloemfontein on 22 October 2012 (time and venue still to be confirmed). Entrance will be free of charge. Contact me at runningtherace[at]live[dot]co[dot]za if you are interested in either of the above-mentioned courses and I will gladly send you the relevant registration forms and forward your request on to Zola. Such a nice article. I agree with Jill, so interesting about former Olympians...I was in high school and cried real tears when Mary Decker fell. Nice one Karien! Zola is as much part of running in SA as Bruce Fordyce is. Thanks for sharing this! Great article. If I remember she used to run barefoot.